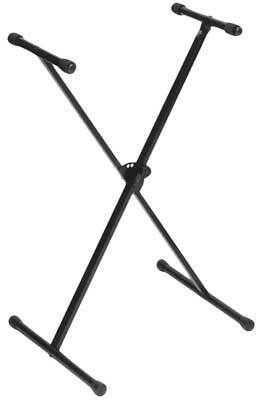 Shop On Stage KS7190 Single Braced Keyboard Stand from AMS and enjoy Fast & Free Shipping. The On Stage KS7190 Keyboard Stand is perfect for musicians who just want things strong, simple and affordable. On Stage continues to offer this basic Single-X stand with its classic bullet-nose pull knob. And it's tough, too, holding up to 130 lbs. The adjustable rubber arm sleeves can be positioned to fit virtually any keyboard width. Height is adjustable from 27 to 38 inches. Very mobile and light.works great. Great x-brace keyboard stand. Stable and sturdy. No issues. This is like the 3rd On Stage x-brace one I've bought. Love their products, especially the KSA8500 deluxe keyboard tier (I have two of them).